Thousands of child soldiers dragged into South Sudan’s civil war are unlikely to be freed soon because aid agencies lack funds to care for them, a UN envoy said. Government signed a peace deal with rebel factions in September to end a civil war that killed at least 50,000 people, but many children were forced into the conflict are still in military camps in the bush, Virginia Gamba, UN envoy for children and armed conflict, said. Gamba, who spoke to former child soldiers, said a lack of resources to re-integrate the children meant they remained at extremely high risk of abuse. 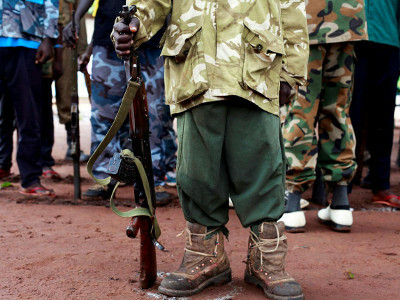 Since January, 900 child soldiers have been freed and Gamba expects a further 1,000 releases by the end of the year. There are many more, she told reporters. “The first group of released children kept telling me at least two or three of their friends were still in the bush waiting to be released or waiting to be negotiated and asking me to intervene on their behalf,” she said. UN funds for reintegrating children halved over the past seven years while needs doubled and aid workers cannot cope with a sudden mass release, she said. Eighty percent of violations were committed by the army, but all warring parties were guilty, Gamba said. A South Sudan army spokesman declined to comment. South Sudan agreed a joint action plan with the United Nations that would allow aid workers to reach into the former war zone and verify child numbers in military camps. Freed children – 40% girls – might get six months help to learn a skill like carpentry or sewing so they can fend for themselves, but they will never go to school. “These kids are condemned for the rest of their life … their dreams will never be achieved,” Gamba said.